Some creatures are totally alien-looking, hard to believe they share the same planet with us. 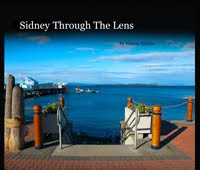 This one, living in Sidney Ocean Discovery Center is a good illustration. Took quite a few visits to catch it moving around - most of the time thing just curls up and sleeps. Finally it rewarded me with quite a dance. Below are just 9 out of 68 shots. Thanks technology for usable ISO 2000 (that's for gearheads, normal viewers just never mind). Right out of a nightmare, eh?